Granular aquatic herbicide and algaecide for lakes only. Just $99.99 for 20 pounds! 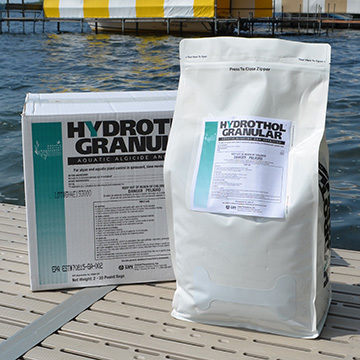 Hydrothol® Granular is a granular aquatic herbicide and algaecide for lakes and controls nearly all types of lake weeds, including milfoil and hydrilla. We recommend using Hydrothol® Granular and MuckMaid®. Hydrothol® Granular will control submerged weeds and MuckMaid® will consume nutrients and silt that help aquatic weeds grow. Hydrothol® Granular should be spread evenly throughout treatment area when plants are present. Most effective when applied on a calm day. When applying Hydrothol® Granular aquatic herbicide, we recommend using a broadcasting spreader. Hydrothol® provides control where you need it, in the application area, not away from the target area. For this reason, Hydrothol® is a valuable tool in improving access to the water for recreational activities such as swimming, fishing, and water skiing. Hydrothol® is effective in muddy or murky water because it does not bind to the suspended sediment or organic matter. Hydrothol® is also an effective algaecide. What aquatic plants are resistant to this product so we can plant them and return oxygen to the lake? Will this work in water and on weeds like bull rush wild rice? Love the granular pellets. Easy to apply from the dock with a broadcast spreader. We have curly - leaf pond weed, milfoil and hydrilla. Also a little algae along the shore. This works great on all. We apply early summer and early fall.